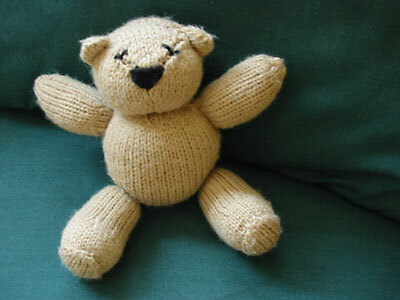 I knit this bear for a friend’s new baby. It is so cute that it nearly turned my normally-sensible mother into a woman who would steal teddy bears from small children. Be forewarned. I love the finished product; the pattern, not so much. There was a thread on Knitter’s Review a while ago asking why toys are so hard to make. I don’t think toys are really hard to make; most of the ones I’ve made are basically lots of tubes with about as much shaping as your average hat. I think a lot of toy patterns are hard to read. And this pattern is a perfect example of the designer making your life unnecessarily difficult. From the picture above, you can see that the arms are sort of shaped like lopsided footballs (the American kind). I think most experienced knitters, to make such a shape, would cast on a small number of stitches, join in the round, increase until desired width, work straight for a while, decrease, and then bind off. Or if you want to work flat, omit joining in the round, but do basically the same thing and then seam the sides together. She has you cast on a small number of stitches, knit a few increase rows, break off the yarn, and make a second piece like that. Then you join the two pieces, knit straight for a while, then you work on half the stitches to shape the point. Then you rejoin more yarn to make the other half of the point. Sew a bunch of seams. Why on earth would you want to do that? I don’t think it’s particularly beginner-friendly and it creates a bunch of extra ends to darn in. The way she has you build the foot is even less logical. Needless to say, once I figured out what the shapes of the finished parts were actually supposed to be, I modified the pattern extensively to save myself some extra work. And then came problem #2: there are no schematics! [Added: Which is why I drew some here.] There are no schematics in the entire book, which isn’t much of a problem for your average drop-shoulder baby sweater, but does create a problem for assembling the bear. I spent a lot of time trying to figure out which end of the body was up and which was down. Not only are there no schematics, there are also no orienting cues in the text, and there are no naked pictures of the bear to help you. I eventually decided that the small hole was for the head, while the open bind-off edge went on the bottom. If I’m remembering correctly, the labels for Right Side Head and Left Side Head are also backwards. Lack of good schematics and assembly instructions also seems to be a common problem in toy patterns. 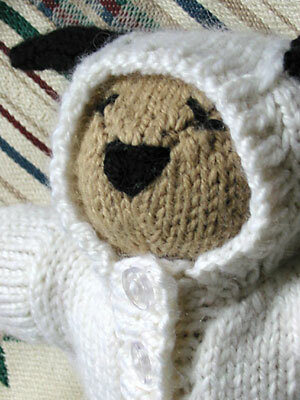 Making the lamb sleep suit was much easier. The pattern instructions for it were comparatively sensible and straightforward. You may want to covert the directions for knitting the arms and the legs of the suit for knitting in the round, but I didn’t. I used a heavier yarn than the pattern calls for, so my bear wound up around 8″ tall. Eight inches of pattern frustration hidden behind the super cuddly cute. 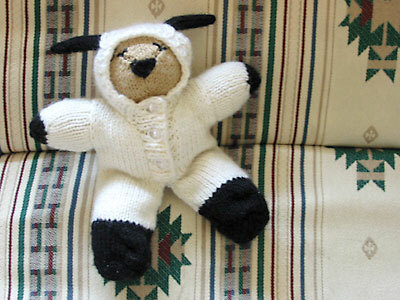 CogKnition posted this on October 9th, 2007 @ 10:39pm in Finished Objects, Toys | Permalink to "Bear in Lamb Sleep Suit"
Unfortunately the only pictures I have are the ones on my blog. I’ve already given the bear away, so there’s no taking more. But I should be able to draw up some diagrams later; I’ll send you an e-mail when I do. The labels for the sides of the head in my copy of the book are backwards. So what is marked “left side” is actually the right side of the bear’s face and vice versa. If the pieces of the head aren’t making any sense, try flipping the left and right side around. What should happen is that the two side pieces will meet from the bear’s chin to the nose, leaving a V-shape at the top. That’s where the triangular forehead piece goes. The cast-on edge of that piece is the very top of the bear’s head. For the body, I decided that the bind-off edge was the leg end. The legs are indeed confusing. The little gap that the instructions have you make is the instep. Sew that shut first. Then sew the little round piece to the cast on edge. As you sew this seam, the leg piece will curl around the round piece and start to be more leg shaped.